Organs with flattened pipes, made out of boards or paper. Or a viola, where the bow is drawn with the elbow, like the bellows. The principle of the Continuous Organ is identical to that of the Continuous Wind Pipe drawn on the same folio. The player wore the instrument using the shoulder straps and a hook attached to a belt .The player’s arm moved the wall dividing the two bellows sideways left and right. Thus, one of the two bellows moved air towards the pipes while the other filled up with air. 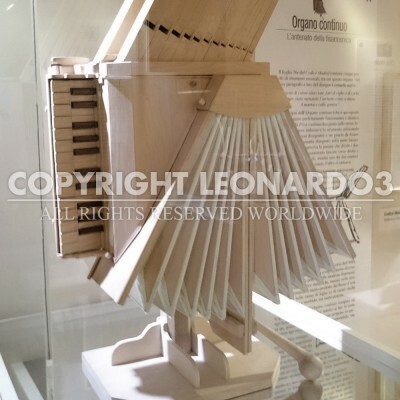 This instrument is particularly interesting because its sound quality and intonation are probably better than those of any other instrument designed by Leonardo. Its double-bellows system distinguishes it from the other small organs of Leonardo’s day. 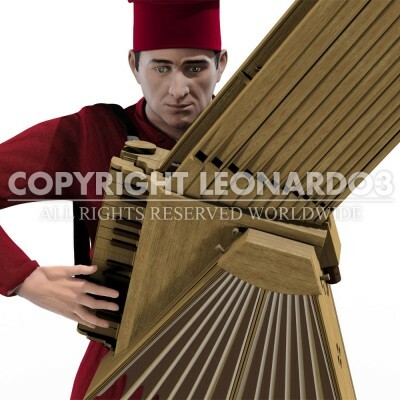 Because of the similarity of the double bellows, the production of continuous airflow, and the presence of a lateral keyboard, the Continuous Organ can be considered the ancestor of the modern accordion, even if the sound was completely different. The lively and powerful tone of modern accordions is produced by metallic reeds. In Leonardo’s instrument the sound created by the airflow entering the wooden (or paper) pipes is much milder and softer, though less powerful.